Friday’s Add-on-Con was a fitting finale to a very exciting week for browser add-ons. I said it last year and it was true again: I had a great time meeting so many people who care about add-ons and want to be involved in making them better for everyone. My thanks goes to the organizers, especially Robert Reich and Fraser Kelton, for all of their work to make the conference happen. I think both sessions I was involved in (the marketplace keynote and Firefox Add-ons session) went well, as “reluctant” as some may feel I was. It was exciting to see the increase in Google’s involvement this year with the beta launch of Chrome extensions last week. The conference was certainly more lively than I remember last year’s, where Mozilla had the only booth. 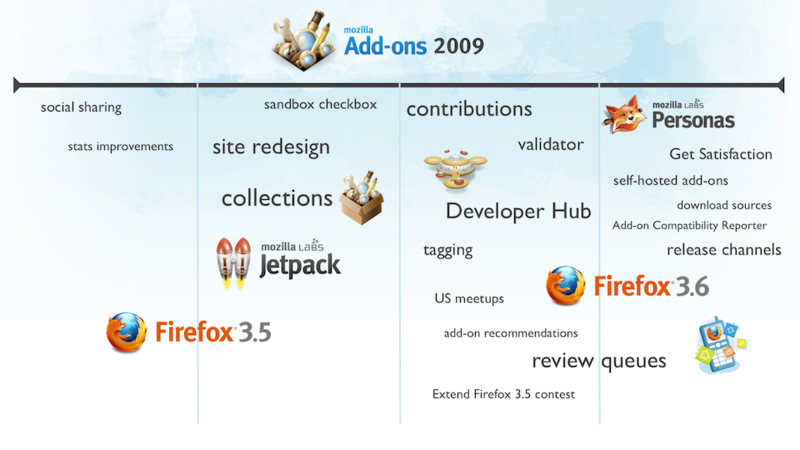 There are two slides from my presentation on the Future of the Firefox Add-ons Ecosystem that I wanted to highlight. The first shows the larger projects and initiatives that we undertook this year, roughly broken into the quarter that they took place. One nice thing about having Add-on-Con in December is the opportunity it presents to look back on the year’s accomplishments. The difference between the design, features, and process of AMO in December 2008 and December 2009 is staggering. It’s hard to imagine looking back over 2010 at this time next year and it being as incredible as this year, but I’m hopeful we can pull it off. 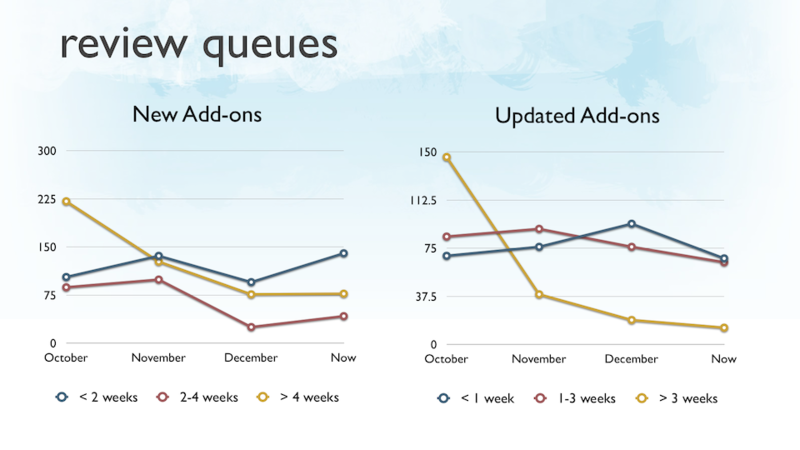 These graphs show that in October, the norm was to wait more than 4 weeks for a new add-on to be reviewed and more than 3 weeks for an add-on update. Not only has that been completely reversed to where new add-ons are reviewed in less than 2 weeks and updates in less than 1 week, but the overall volume of the queues has been reduced. That’s not because there are fewer add-on submissions (there are actually more), but because the number of reviews has increased significantly. So, a huge thanks to Jorge and the AMO editors for their hard work the last few months! 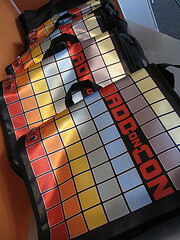 I’m already looking forward to Add-on-Con 2010 because I know that next year will see an explosion of add-on innovation powered by new technologies like Jetpack and Chrome extensions.